We simply could not let this Wednesday go by without a toast to... well The Toast. My friend, Ann sent along this Washington Post link. Check out Jonathan Capehart's Post article complete with the full video. Obama's been in office for less than three years and he is on his third social secretary. 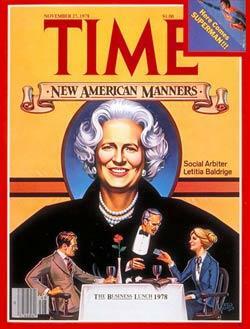 I say you still can't beat Letitia Baldrige. Last Wednesday we did not have an etiquette post, but one of our favorite bloggers did. Check out this post by the most darling Reggie Darling. I noticed that it has caused quite a bit of comment! Why, just the other day I was perusing Letitia Baldridge's updated Emily Post etiquette book, when researching the table settings post that you have so graciously linked to here. Great minds think alike! Thank you very much for the link, m'dear. 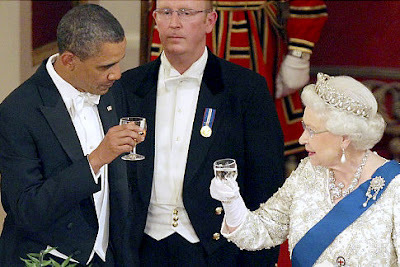 Doesn't the Queen in your photograph look wonderful? Etiquette ? what the hell is that, please give me an explanation!